It is a dark, gray, cold, soaking day in the Pacific Northwest. So what better way for an artist to spend it than painting something fun, bright and cheerful. Here is a watercolor and ink painting of one of our local Douglas Squirrels. These are the most active forest creatures I know. They just can't sit still for any length of time. These adorable bright rust and ochre colored, small squirrels literally zip about in the trees, dashing here and there so fast - it's a challenge to keep your eye trained on one. We have a few that visit our feeders and they are quite brave and will challenge the larger introduced species, gray squirrels - even though the little Douglas is half the size. Also, one individual in particular will alert me when I'm in the kitchen or the garden - to the fact that the feeder is out of seed. He stands on his favorite oak branch and just chatters and chatters at me until I add sunflower seeds to the feeder. This time of year they also enjoy the winter berries. I just love these little squirrels! 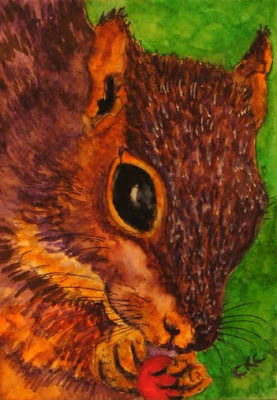 The bright colors and large expressive eye really make Douglas Squirrels fun art subjects. Also, with the green background and red berry - I must be thinking of the holidays. Enjoy! This has been a fun week. I am designing a few porcelain ornaments that will feature my daughter's and my art for the holidays. These make wonderful Christmas gifts. I have a collection of different subjects to choose from - my art focuses on wildlife. Visit my Website, browse and Please feel free to leave comments and suggestions here on what subjects would work well for ornaments. 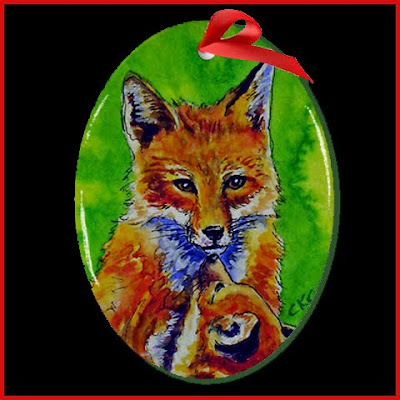 This is a design that I enjoy - a mother and kit red fox. The ornaments come with a red ribbon to hang them on your festive tree! Visit my Gift Shop to see more ornaments and magnets.